A 15th century religious painting looted from a Berlin art museum in 1945 is back in Germany, returned by the Indiana University Art Museum, in Bloomington, Ind. 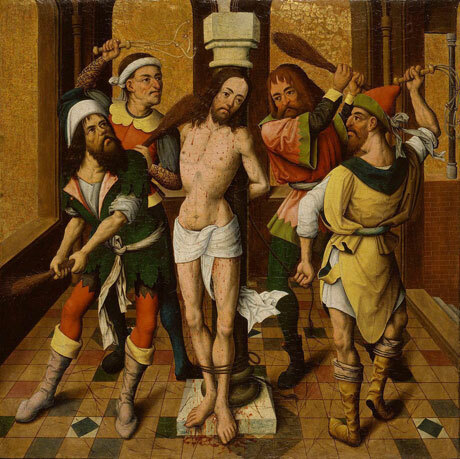 The Flagellation of Christ was created by an unknown artist of the Cologne School of the 1480s and originally formed a wing of an altarpiece. It was one of more than a dozen paintings that disappeared from Berlin's Jagdschloss Grunewald museum during the summer of 1945, looted by British and Russian soldiers. "One of the many tragedies associated with World War II was the loss of countless works of art that were stolen, confiscated, looted, pillaged or destroyed," Michael McRobbie, the president of Indiana University, said during a handover ceremony Monday at the Charlottenburg Palace in Berlin. In recent years, many works of art looted from museums and Jewish collectors by the Nazis have been returned to the heirs of the original owners. The Indiana University Art Museum agreed to return the painting after a two-year investigation of its provenance. The Prussian Palaces and Gardens Foundation had contacted the university in 2004, saying it believed the painting had originally belonged in its Jagdschloss Grunewald museum. The German museum delayed getting the painting until now because it's been undergoing an extensive renovation. The Flagellation of Christ is an oil on panel showing a bloodied Jesus being whipped by four men. It is believed a British soldier looted it and brought it with him to England, where it was sold through an art dealer. In 1967, former Indiana University president Herman Wells bought the painting. He brought it to Bloomington, where he displayed it at his home. In 1985, Wells donated the work to the school's art museum. Neither Wells, nor the museum, knew the painting had been looted, the university said in a press release. In 2004 and 2010, the Prussian Palaces and Gardens Foundation published two catalogues of art lost during and after the Second World War, including The Flagellation of Christ. A museum spokesman said the American university has been cooperative about returning the work. Neither museum would estimate the value of the painting, but said it was priceless in its importance to art history.